Death Metal is one of my favorite subgenres ever, and I really enjoy it when bands mix things up a bit and go above and beyond with their music. That’s exactly what CREINIUM does with their sound, and this is shown with their EP entitled “Project Utopia.” It keeps you wondering what’s going to happen next, like the musical form of a page-turning book. 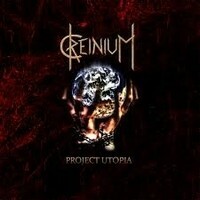 CREINIUM shows qualities of Progressive Metal and Black Metal. The opening track “Societal Collapse” powerfully and slowly builds up to a strong finish with intense melodies. The third track “New World Order” is my personal favorite out of the five. Dignified synth lines and fierce vocals throughout the song make it an exciting one. “Synthetic Paradise” tops off the EP with more hints of Progressive Metal. The keyboard solo is surprising and it kind of gives the song a positive feeling overall. I hope to see good things from CREINIUM in the future as I was blown away by this EP.